Our approach has an intentional emphasis tailored to meet the individual, emotional and intellectual needs of your child. 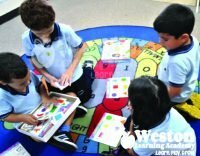 We provide hands-on activities based on a self developed bilingual curriculum to offer each child a nurturing environment to learn, play and grow. Key pad to access the school building. Biometric scanner (fingerprint reader) system for check in and out procedure. Closed circuit camera monitoring in every classroom, hallway, playground and front entrance. Using colorful visual tools and hands-on projects to help our children develop in our multi-language community. Staff members are fluent in Spanish and English. Our carefully screened teachers are trained to nurture and enhance each child’s unique development process and are CDA certified. Staff members are trained in pediatric first aid/CPR. All staff members are vetted via fingerprint as well as local and federal background check. Fresh and nutritious meals are delivered daily to our school by a private catering company, upon request. Parents are also welcome to bring meals from home. Our kitchen is equipped to keep meals warm and ready for lunch time. We provide parents with daily progress reports as well as quarterly assessments to monitor each child’s academic and social progress. 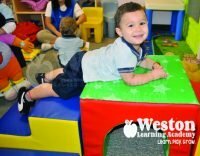 One-on-one time is fundamental in every child’s early learning and development. We keep our classes small to provide students with lasting academic benefits. 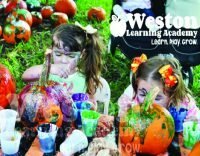 Dramatic play, music and art are just a few of the activities included in each child’s daily curriculum. Part-time or full-time; we offer different time schedules to fit every parent’s need.